You never know when you’ll need the services of a locksmith. That’s why it’s good to know you can call Lock Dawg Locksmith in Winder, GA. We offer a fully mobile locksmith service which means we will come to you no matter where you are within our service area. We also offer same day service that is fast and affordable. 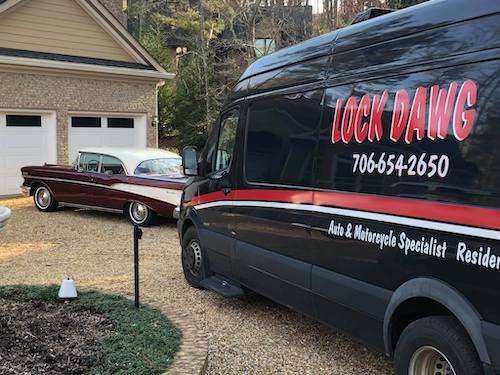 No matter if you need help with residential, commercial or automotive locksmithing services, Lock Dawg has you covered. For more about our home lock services read here. For more about our business lock services read here. For more about our vehicle lock services read here. Our mobile locksmith will come to you! We offer a wide variety of residential locksmith services. Our home locksmith services in Winder, GA are second to none. Lock Dawg can help with minor problems such as getting locked out of your home all the way up to installing new deadbolt locks on your doors or rekeying your locks. One of the most frustrating experiences is that of getting locked out of your home. It can leave you feeling panicked and may lead to damage of windows and locks when you try to break into your own home. With Lock Dawg Locksmith nearby, there’s no need to panic or cause damage to your home. We have the tools and experience to get you back into your home quickly without causing any damage to your home or locks. Your keys have been lost or stolen. Your tenants are moving out. Rekeying the locks in your home is more convenient and cost-effective than replacing the locks. Ensuring that your business is protected from the outside world is a priority. Confidential data, merchandise and even your furniture and fixtures can be expensive and require a high level of protection. The success of your business may very well depend on keeping it secure at all times. Lock Dawg can provide commercial locksmith services to ensure your business is safe and secure. The locks on your building are your first line of defense in protecting your business. If you require new lock installation, our professional locksmiths can install the locks and make sure they are working properly. Don’t leave the security of your building to chance. Let Lock Dawg install your locks so you can be confident your business is locked down tight. The great thing about our mobile service is that it allows us to come to you whenever and wherever you need us. This is especially convenient if you find yourself locked out of your car or need a key extracted or any other automotive locksmith service. When you find yourself in a bind, call Lock Dawg, the best car locksmith in Winder, GA.